Multiple micronutrient deficiencies are rampant in India, and continue to be significant public health problems, which adversely impact the health and productivity of all the population groups. More than 57% of children suffer from vitamin A deficiency, which may be symptomatic or present at the sub-clinical level. In addition, a high proportion of pregnant women and their new-borns suffer from Vitamin D deficiency. Vitamin D is also considered to play an important role in decreasing the risk of many chronic illnesses, including common cancers, autoimmune diseases, infectious diseases, diabetes and cardiovascular disease. Thus public health problems warrant public health intervention. As per Household Consumer Expenditure (HCE) Survey in India, NSSO report 2011, consumption of oil is reasonably high, about 20-30g / person / day and is consumed by all population groups. Since vitamin A and D are fat-soluble vitamins, fortification of edible oils and fats with vitamin A and D is a good strategy to address micronutrient malnutrition and fortified oil is known to provide 25%-30% of the recommended dietary allowances for vitamins A&D. Mandatory oil fortification legislation was first introduced in 1965. 27 countries have mandated oil fortification, since then. All 27 countries fortify with Vitamin A (range 6-55 mg/kg) and/or (range 0.075-1 mg/kg). Vitamin A is readily absorbed in the presence of oils and fats. After the introduction of vitamin A fortified margarine in Denmark at the end of 1917, the number of cases of xeropthalmia reported at a Copenhagen Hospital fell by more than 90% and by 1918 the condition had disappeared.Xeropthalmia is abnormal dryness of the conjunctiva and cornea of the eye, with inflammation and ridge formation, typically associated with vitamin A deficiency. Studies before and after the fortification of margarine in Newfoundland in 1944 report that the percent of subjects with serum vitamin A below 20 µg/dl declined from 48% to 2% over 4 years. More recently, a shelf stable margarine in the Philippines was fortified with vitamin A. After consuming the margarine for 6 months, the baseline prevalence of children with serum retinol levels below 20 µg/dl fell from 25.6% to 10.1%. The biological value of vitamin A fortified oil has been reported in two studies. Dutra de Oliveira, et al. demonstrated that soybean oil with vitamin A in the form of retinal palmitate is well absorbed in humans given fortified oil along with a rice-based diet. Significant increases in plasma retinol were reported. Differences in plasma retinol for subjects receiving uncooked versus cooked soybean oil were not statistically significant. Favaro, et al report increased weight gain, plasma retinol and liver stores in rats consuming diets, which included fortified soybean oil. Fortification of vanaspati with vitamin A has been obligatory in India since 1953. There is a government notification stating that no oil will be sold loose in the market, which is an advantage for the sale of packaged fortified oil. Government of Gujarat has made oil fortification mandatory in the state since 2006. 70-88 percent of vitamin A was recovered even after 30 days from open pails exposed to light and air at the Indian ports. During Indian cooking as well the levels have been found to be stable. When oil was added to mixture of rice, beans and pulses for Indian feeding programs, around 93 percent of vitamin A was retained after 15 minutes and 90 percent after 30 minutes of cooking. Even with deep frying pakoras in vanaspati at 200 ℃, retention ranged from 71% after 5 minutes, to 41% after 15 minutes .The stability of Vitamin D is found to be similar to that of vitamin A as little or no loss is reported during processing or storage. Multiple micronutrient deficiencies are rampant in India, and continue to be significant public health problems, which adversely impact the health and productivity of all the population groups. More than 57% of children suffer from vitamin A deficiency, which may be symptomatic or present at the sub-clinical level. In addition, a high proportion of pregnant women and their newborns suffer Vitamin D deficiency. vitamin D is also considered to play an important role in decreasing the risk of many chronic illnesses, including common cancers, autoimmune diseases, infectious diseases, diabetes and cardiovascular disease. Thus public health problems warrant public health intervention. As per Household Consumer Expenditure (HCE) Survey in India, NSSO report 2011, consumption of oil is reasonably high, about 20-30g / person / day and is consumed by all population groups. Since vitamin A and D are fat-soluble vitamins, fortification of edible oils and fats with vitamin A and D is a good strategy to address micronutrient malnutrition and fortified oil is known to provide 25%-30% of the recommended dietary allowances for vitamins A&D. Oil fortification technology is simple and the equipment and premixes for fortification are readily available, within India. 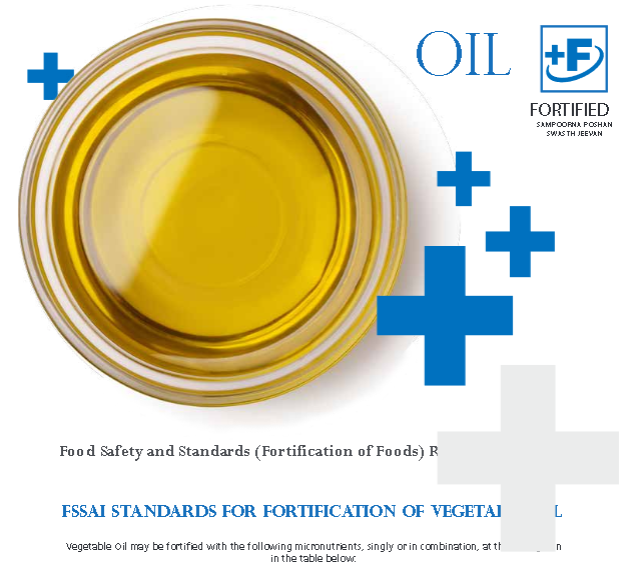 Fortification of edible oil usually takes place just before packaging of oil. Both the vitamin pre-mix and the processed oil are added to a churn to ensure uniform blending. The concept, technology and quality control procedures for oil fortification are well established for sustained production across the country. Fortification of oil is relatively inexpensive and affordable. 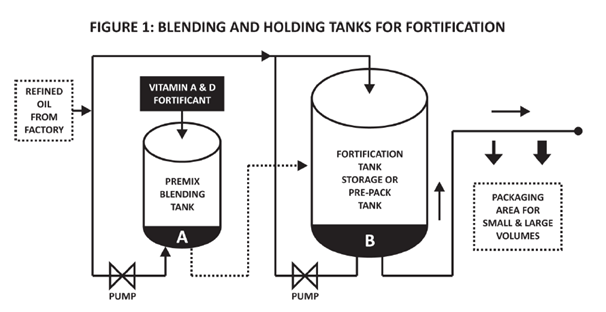 The technology of fortification is simple and easily achievable by producers.3 As these are fat-soluble vitamins, they permit easy and cost-effective addition without the need for elaborate equipment and can be uniformly distributed in oil. Dosing technology for adding anti-oxidants and other micro ingredients to oil is routine. 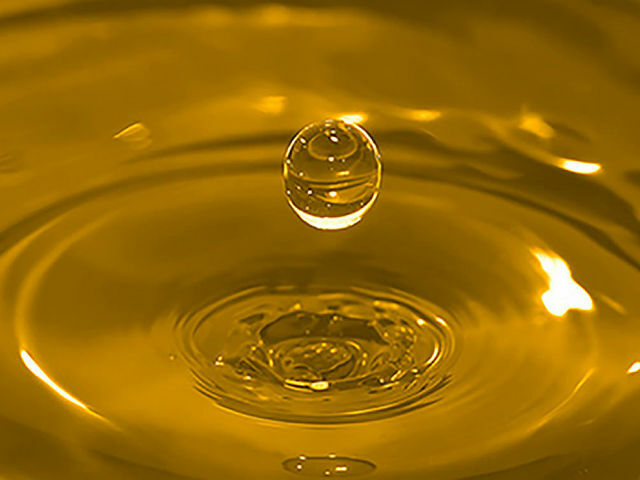 While for many oils, a temperature of 40-50 ℃ is required to assure uniform mixing, the threshold to ensure uniform liquid state for oils like soybean oil is less than about 25 ℃. Producers generally report minimal adjustments to add vitamin A, D, E. Since other additives are often used, personnel and technology are already in place. The additional cost due to fortification is 7 paise per litre of oil with Vitamin A and D.
The recent step to include Fortification in our products signifies our constant endeavor to live up to our promise of 'A Healthy Growing Nation'. 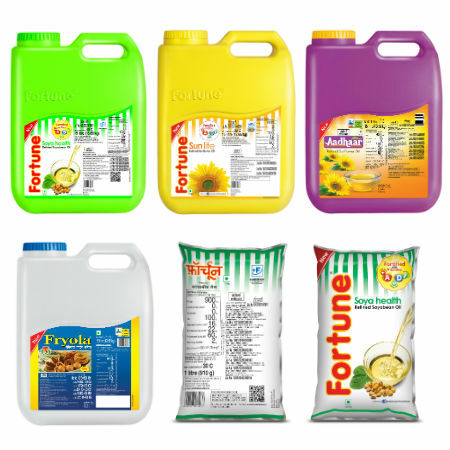 We began fortifying the edible oils right from May 2017. 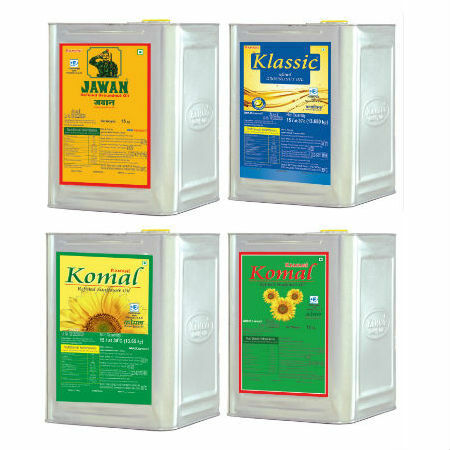 We fortified with Vitamin A & D as per the government regulations and primarily aimed to cover our celebrated range of Fortune refined edible oils such as Cottonseed, Soybean, Sunflower, Rice Bran, Groundnut and later also in our other brands such as Aadhar, Kings, Fryola, Raag Gold and Alpha in the SKUs up to 15 L/ Kg. We cater around 30 million households nationwide per month. Moreover, we have already started heavy promotional activities on various platforms informing our consumers about Fortification & resultant benefits. ADM started fortifying edible oils with Vitamin A&D in 2011 with one of its variant. In 2016, another variant was added taking the range of fortified products to about 75% of its packed oils sales. Since 1st May 2017, 100% of the packed refined oils range is fortified with the current level of requirements of Vitamin A&D. Our distribution of packed refined oils is limited to few states in West, South & parts of north India reaching to about 100 million people. For more than 150 years since inception, Cargill is committed to feeding the world in a responsible way. It is passionate about its goal to be the global leader in 'nourishing people'. In India, cooking oil use is nearly universal with 99% penetration in Indian households. Fortifying oil with essential vitamins A, D and E creates the opportunity to reach all income groups with minimal changes in eating habits. Cargill India serves more than 25 million households with a host of brands including Gemini, Nature Fresh, Leonardo Olive Oil, Sweekar, Rath and Sunflower Vanaspati. 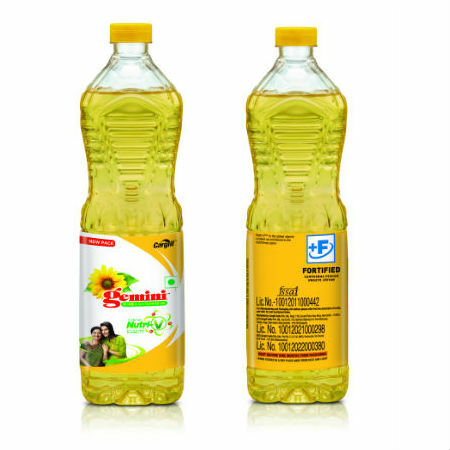 It was the first company in edible oil industry which has fortified its refined edible oils in 2008 with Vitamin A, D & E, starting with its brand Gemini Cooking Oils and later in Nature Fresh Actilite Cooking Oils and Sweekar Sunflower Oil. It has been playing an active role in promoting the need for fortification and educating the customers through its packaging, promotions, engagement and all other initiatives. Dhara began its journey with the vision to provide the best Quality & Nutrition through its edible oil. 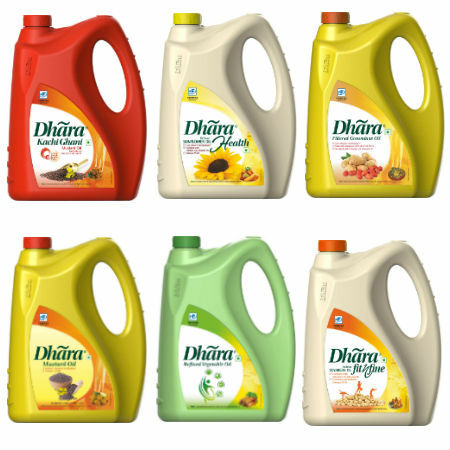 The entire range of Dhara variants, the cheapest oil at one end and the most expensive oil at the other end of the price spectrum, are fortified with Vitamin A and Vitamin D. These include Dhara Filtered range of Oils like Mustard and Groundnut to Refined Oils like Soybean , Sunflower, Rice bran and flagship Dhara variant Refined Vegetable Oil providing the choicest of Oils to consumers. Fortification in Dhara branded oils were adopted almost a decade ago by the organisation. Dhara has a distribution bandwidth extending from Jammu to Port Blair, serving to every small and big towns and villages other than the Tier 1 and Tier 2 cities. 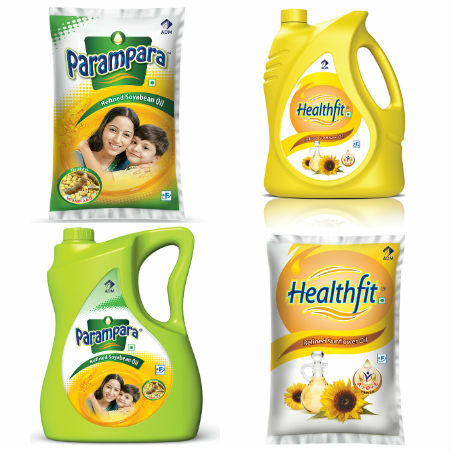 From the extremes of the North Eastern States to Bihar and Uttar Pradesh, Dhara pans out its reach to every consumer. 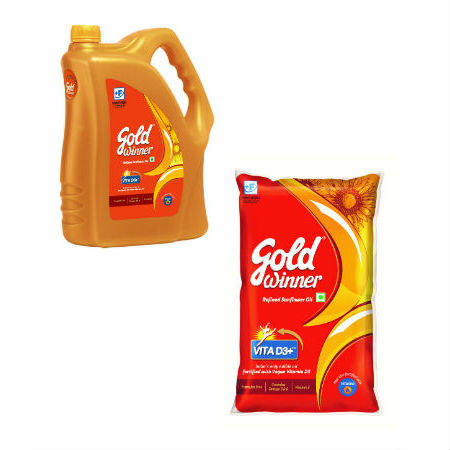 With India hitting the charts of Infants and children malnutrition, Fortified Oil being one of the 5 basic staples with 99% household penetration, Dhara provides nutrition to the last mile with its cheapest variant being available . Apart from ensuring availability of fortified oil to all parts of India, there has been consumer awareness on importance of fortification and nutrition of oil, through various ongoing marketing activities. We at Dhara will continue to engage with various government initiatives to combat the burden of malnutrition.